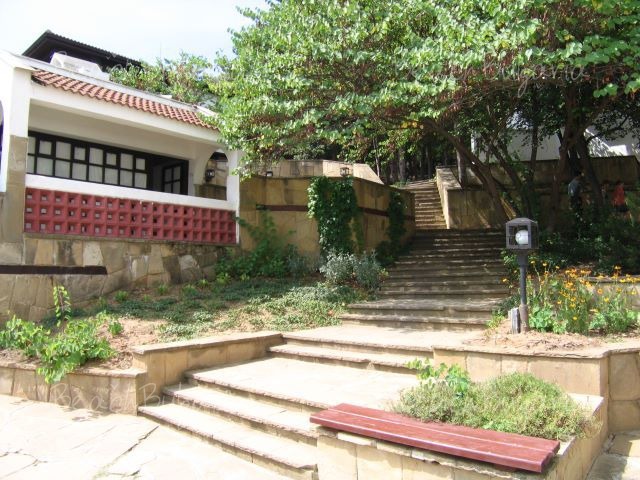 Holiday Village is located in the central part of Duni resort, about 400 m from the beach. Picturesque alleys lead to the 4 hotels and family houses of the Holiday Village. - 165 standard rooms (26 sq.m) with twin beds. 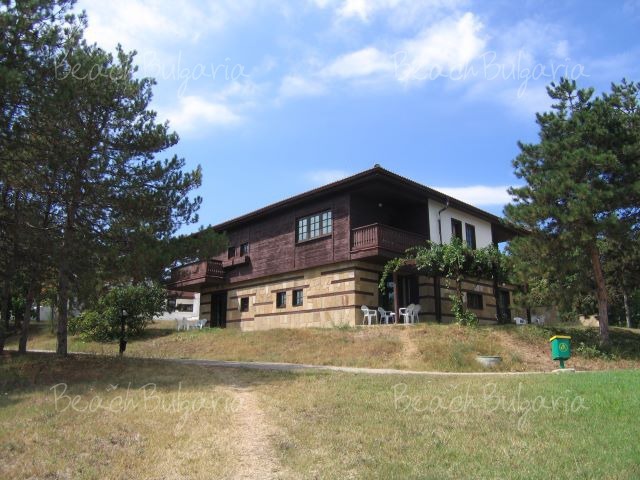 -128 family rooms (33-36 sq.m), a bedroom with a king-size bed and a living-room with a sofa-bed. 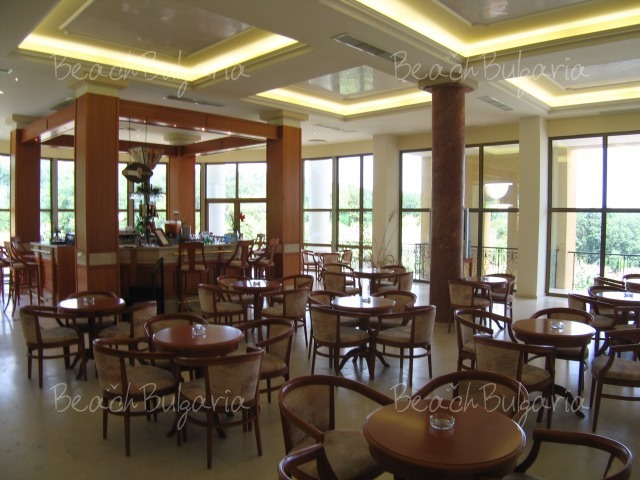 The complex offers a main restaurant with non-smoking corner and children corner, as well as Mehana – a typical Bulgarian a-la-carte restaurant. At guests' disposal are lobby–bar, pool-bar and bar at the tennis-courts. 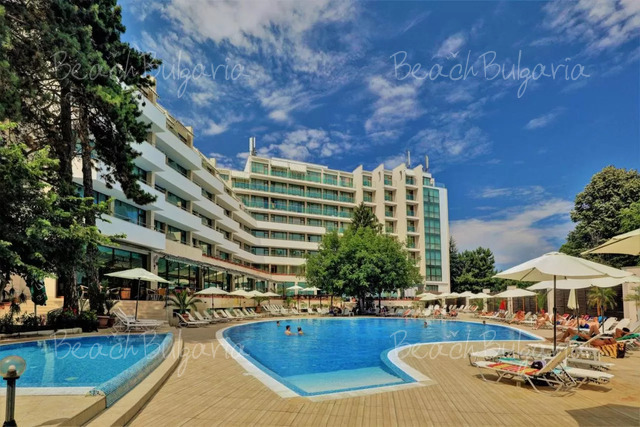 Swimming pool, children's swimming pool, open-air gym, sauna, jacuzzi, 7 tennis courts, archery center, mountain bike center, horse-riding center. * The prices are in Euro, per roomper nght, all inclusive. 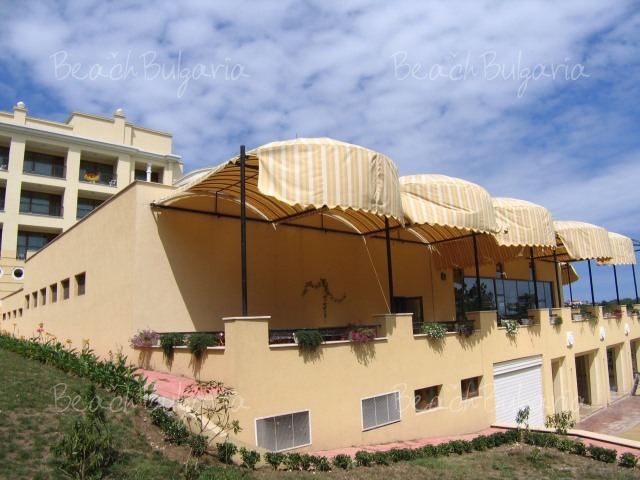 Guests of the hotel can use swimming pool, parasole, sunbed near the pool and on the beach, aquapark and parking for free. The campus is a small paradise, rooms are clean but not fancy. I didn't see air conditioning running and there is no hair dryer or mini bar. TV had only a few programs (2 German, total 10). The food was terrible, looked bad and tasted bad. They reheat the soups from previous day and even put the same bowl of fish egg salad just wiped on the sides and leveled a little. The coffee machine was working just between 7:30 and 10:00. Not to mention there was no teaspoon whatsoever. All juices had a weird taste either chemical or mold. I don’t know about alcoholics (never tasted) but the local white wine had a strange phosphorescent color. Sports are just on the list, I saw only on the tennis court some people. We tried to rent bikes or go kayaking but the bikes were broken and about kayaks nobody knew a thing. They just sent us to ask another and another person. The personnel were so grumpy that you feel like an intruder and want to stay away from them. Anyway they cannot help you in any way because they don’t know and even if they know, they hardly can put together a phrase in English. Too bad because the location is marvelous, well maintained and a bit savage, away from any noisy resort or city. p.s. paid parking although you can not get there otherwise than by car! Deceiving experience- we will never come again to this resort:the standard rooms are poorly equipped (3 stars and no fridge! !, the windows and the door are old and barely close), the food is disgusting and we noticed they re-cook the food that the tourists didn't eat in the previous days, the staff is arrogant and only at the main bar the drinks are included- so, if you are thirsty in the night(and remember, before 23:00) you have to walk aprox 300m to the bar to get a glass of water. The shops in there had thrice the prices normally seen in other resorts. It's a pity they didn't invest in this great area, cause the landscapes are great. We have just stayed in Sun City and our apartment was 1st class! The area is still being developed but this does not take away the beauty of the area. Old Nessebar, about 5 mins away on bus, is beautiful. Sunny Beach centre is lively, again about 5 mins away from Sun City! Great food and friendly people! Food and drink so cheap. We will definately return for another visit! I found Sun City 1 to offer excellent accomodation. We moved from a more cental complex as we weren't happy with our initial placement. Sun City was far better, clean and well kitted rooms. Perhaps a little more out of the way but I think this is an advantage. 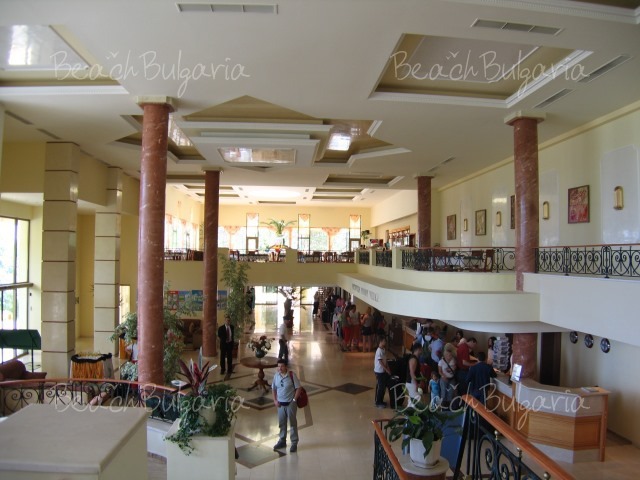 Lovely pool, lots of space and relaxing atmosphere.More centrally located for access to both Nessebar and Sunny beach. Approx 20 to 30 mins walk to the centres of each but facilities are also close by. How far is this really from the centre of sunny beach? Can you walk from the hotel to the main street of Sunny Beach, or do you have to take a cab????? Please tell us, because we're going next week to this resort. 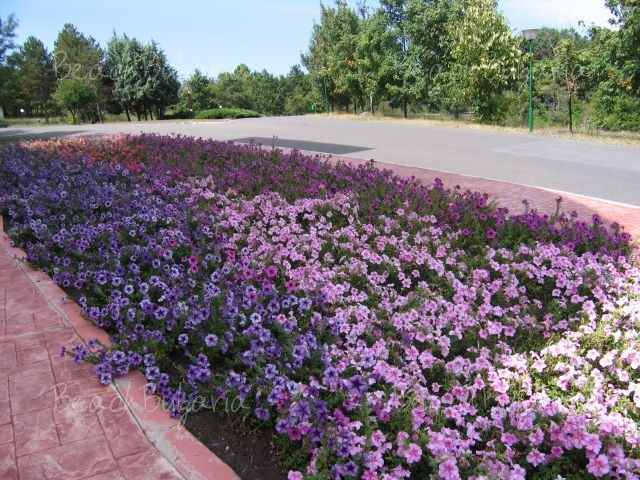 Please, post a comment on Holiday Village. Very small the entertainments for children.